In 2011 we achieved accreditation through Eco Tourism Australia for both our Shark Cage Diving and Swim with the Sealions tours accreditation keeping us at the forefront of sustainable tourism in Australia. 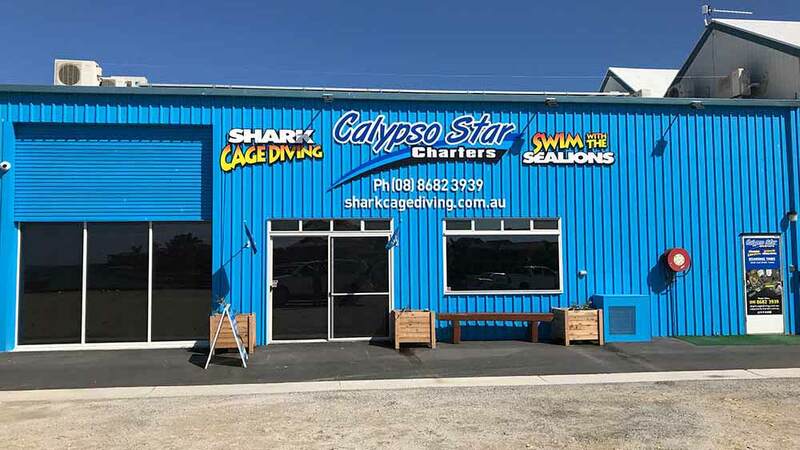 We are the largest and only employers of Eco Certified Guides in the Shark Cage Diving industry in Australia with our Skippers being Eco Certified Guides. Advanced Eco Certification demonstrates our commitment to tourism excellence with strong interpretation values and commitment to nature conservation while helping local communities. 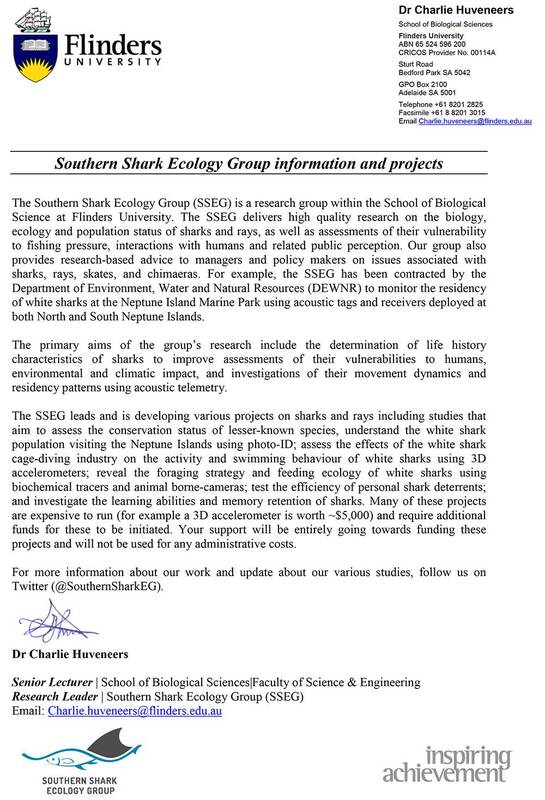 This coupled with our long association with the CSIRO display our commitment to shark preservation and research. Our commitment to the CSIRO research has seen us making financial contributions and also ‘on the ground’ support. 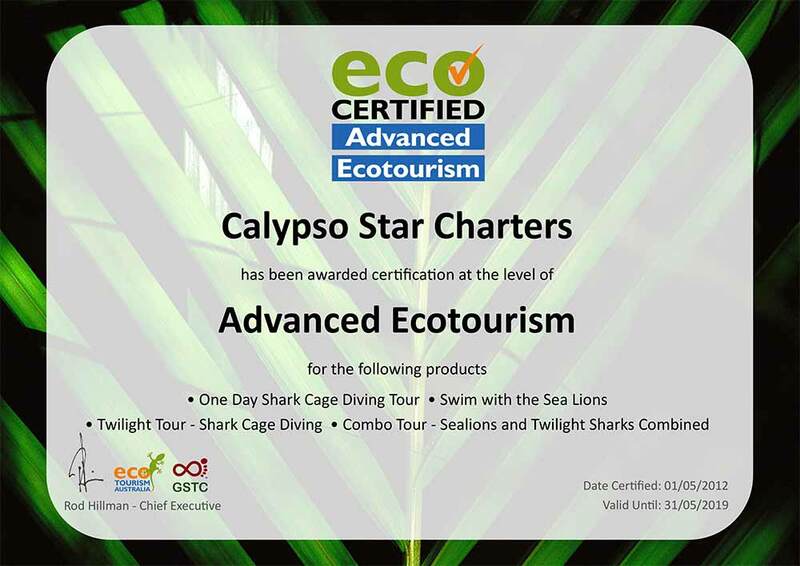 Calypso Star Charters are an environmentally conscious operator with our Shark Cage Diving and Swim with the Sealion tours operating within Marine Protected Areas. Our policy is to be as energy efficient as we can in order to reduce our CO2 emissions from fossil fuel. Canopy’s annual audit and management plan allows us to offset any unavoidable CO2 emissions that we may make by retiring certified carbon reduction units on our behalf. Our tours operate in the challenging marine environment and we visit some of the most pristine locations in South Australia. We strive to have minimal impact on the areas we operate and the animal we see. Some methods we adopt to minimise the use of fossil fuel include meticulous vessel maintenance to ensure peak operating efficiency and carefully monitoring passenger demand to vary the number of tours operated. Greenhouse gas emissions are produced when we burn fossil fuels for electricity, transportation and heating. Increased concentrations of greenhouse gasses are responsible for climate change. Keeping our vessels in top working order and our hulls clean. Heating water with the vessel's generators, not shore power. Operating the Combo Tour, 2 tours in 1. Solar powered lighting for signage. LED lighting throughout our office and the use of movement sensors and timer switches. Our transfer service to 'car pool'. A 15kW solar system at our office. Storing bait at a shared freezer facility. Doing our laundry with cold water, line drying 90% of our laundry and only using the dryer during the day when the solar system is likely to be exporting to the grid. Limiting the use of air-conditioning, setting the temperature slightly warmer in summer and cooler in winter. We are always looking for ways to increase our efficiency and decrease our Carbon Emissions. We utilise the services of Canopy Australia to audit our emissions and offset 100% of the emissions we are unable to avoidFor more information on how offsetting Carbon emissions works and how you can measure your own carbon footprint HERE. 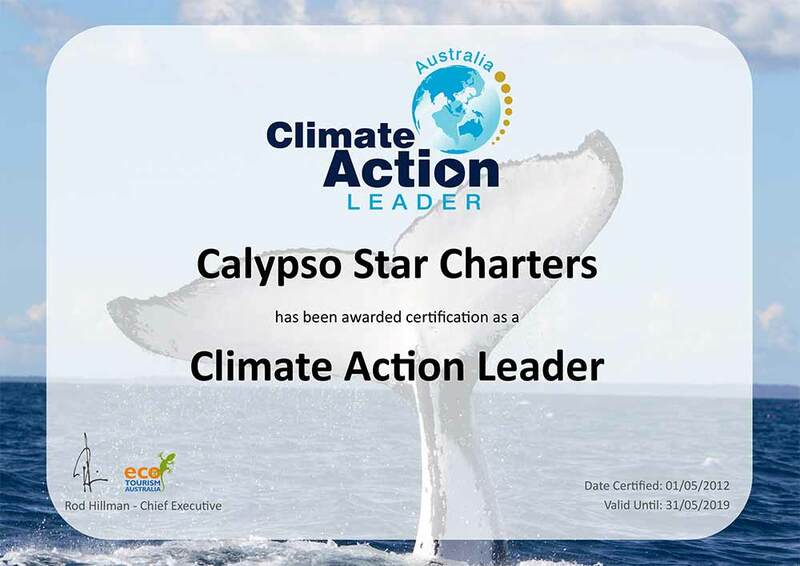 In July 2016 Calypso Star Charters became a Carbon Neutral company through an energy audit and offsets through Canopy. We are committed to the protection of the environment and the minimisation of our carbon emissions. 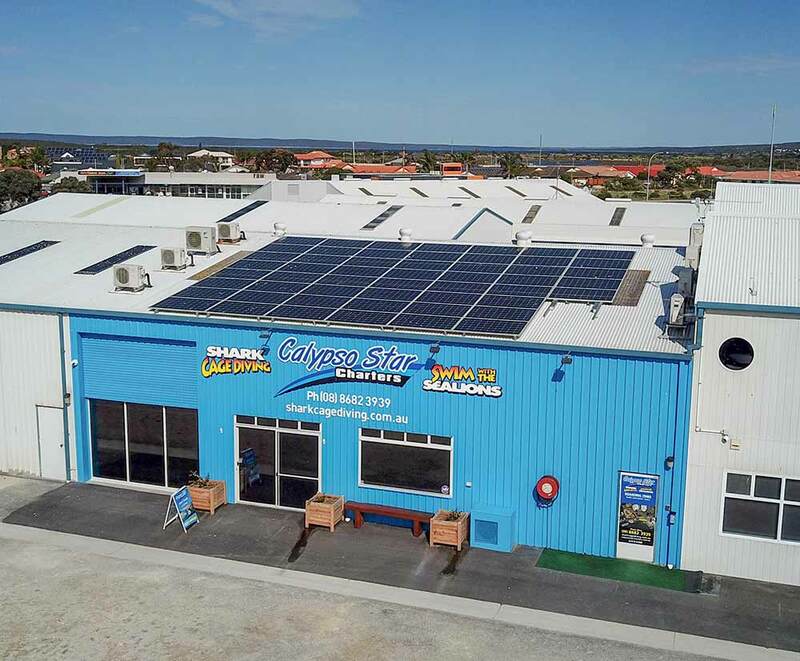 Following extensive research, Calypso Star Charters engaged South Australian company Class A Energy Solutions to supply and install a 15.37KW Photovoltaic electricity generation system at our office at the Port Lincoln Marina. The grid connected system is large enough to supply 100% of the electricity to run or office and vessel shore power requirements, with additional electricity fed into the grid to offset purchases from the grid during times of decreased generation. The increased size of the system will also partially offset power consumption for our bait storage which is provided off site. Electricity consumption accounts for 4% of our total emissions, a figure which will reduce to between 1 and 2% following the installation of the solar system. The system is expected to deliver an average of 70 KW/h per day during spring, summer and autumn, more than double our current needs. The system is expandable in the future and battery storage capacity can also be added at a later stage to enable full independence from the grid. 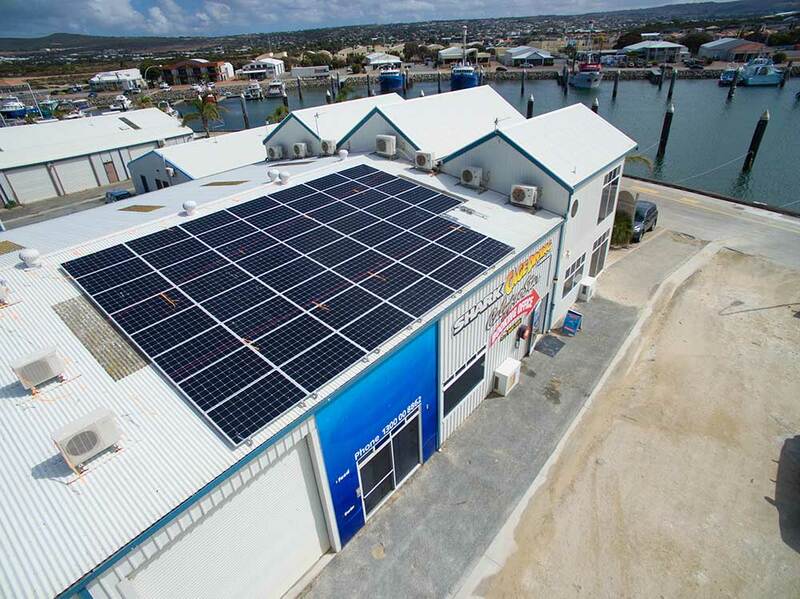 The system comprises of 53, 290 watt JA Solar panels connected to a 15KW 3 phase Fronius inverter. The installation was completed over 2 days with no disruption to our office operations. Flinders University's Southern Shark Ecology Group was awarded a Monitoring and Research contract by DEWNR for 3 years from July 2016. This research monitors the visitation patterns and temporary residency period of the sharks that we see. Information is used in the dynamic management of the Shark Cage Diving Industry to guide decisions regarding Non Activity Days. In addition to the contracted research, Flinders University excels in White Shark research and collaborates with research institutions around the world. Calypso Star Charters is a proud supporter of Dr Charlie Huveneers and his team. Charlie is a frequent guest on board our charters, tagging sharks and deploying or retrieving monitoring equipment. We provide shark images that are used in a growing ID catalogue. The high frequency of our charters assists in gaining a better understanding of the visitation patterns as some sharks only visit for a day or two each year. We are proud to pass on your donations to Flinders University to assist funding White Shark research outside of the monitoring program. You can donate to their shark research when making a booking. Click HERE to read from Dr Charlie Huveneers. The visitor use fee increases annually and is absorbed into the ticket price of our charters. Compliance - DEW regularly engage covert observers across all operators who's job is to ensure license conditions are being adhered to. Operators are required under their licence to adhere stringent regulations and must provide a report to DEW regarding the daily activities. This report includes information such as start and stop times, anchoring position, the number and description of sharks sighted, other wildlife encountered, instances where a shark has taken a bait, made contact with the boat or cage as well as the quantity of bait and berley used, loaded or removed from the vessel. This reporting is mandatory and in no way can be construed as research by an operator. Breaches of regulations can result in formal warnings, expiation or suspension or termination of license depending on the severity of the breech. We are restricted to the number of days operated on a fortnightly basis, anchoring proximity to other operators as well as the quantity of fish based attractant used on a fortnightly basis. Australian Sealions are an endangered species and sadly, their numbers are decreasing. 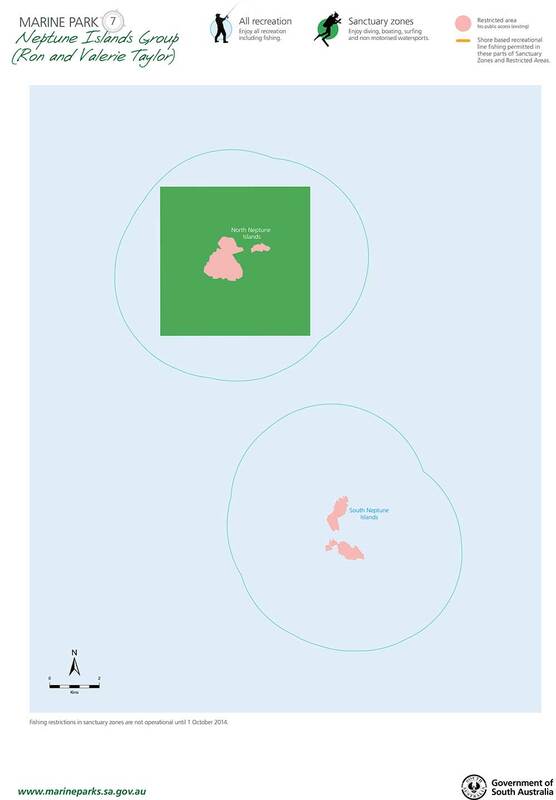 In a sustained effort to help the plight of the species, Marine Mammal permits restrict operators to the number of visits to each site each week and day as well as the duration of the visit and swimming activities to ensure disturbance is minimised. Restrictions are also in place regarding approach distances, anchoring locations, unnecessary noise and swimming areas. Currently there is no visitor use fee charged by DEW for Swimming with Sealions but we remain committed to the protection of the species and continue to operator our tours with strict adherence to regulations. Compliance, as with shark cage diving, DEW utilise covert observers on tours to ensure compliance as well as monitoring social media and prompt actioning of complaints and information received from the general public. Breaches of regulations can result in formal warnings, expiation or suspension or termination of license depending on the severity of the breech. 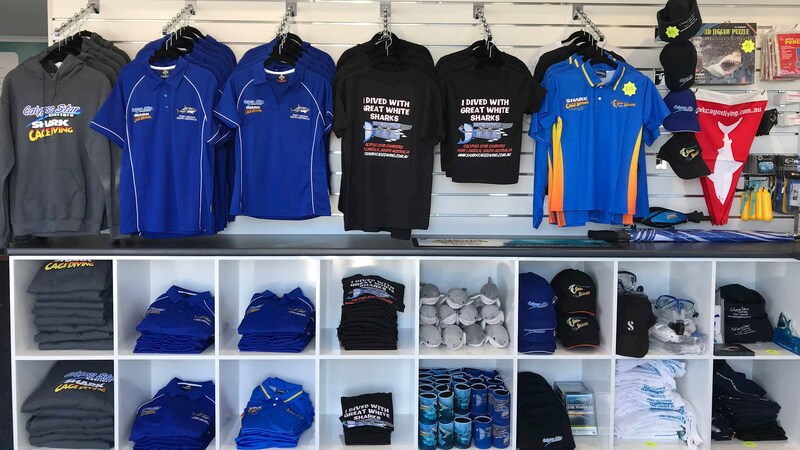 Located at the Lincoln Cove Marina, our Office and Shark Display is open 7 days per week. Learn about Great White Sharks and Australian Sea Lions. The display also includes a large map of the surrounding areas and Marine Park information. With no entry fee, feel free to pop in to say hello! The office is also the place to meet to check in for all tours before boarding. Free parking and free wifi available! Named after Australian filmmakers, marine conservation pioneers and renowned shark experts Ron and Valerie Taylor, the park is an internationally-significant site for great white sharks. It is also the only place in Australia where you can get up close to this protected species in their own environment. Centred on a remote, offshore island group rising steeply from deep water and exposed to strong wind and waves, the park includes sheltered seagrass, a sandy seafloor and deep-water habitats, with a range of marine life, from reef fish to various species of shark. The park is also home to breeding and feeding sites for many local and migratory birds, Australian seas lions and long-nosed fur seals. We visit on our Swim with the Sealion tours to Langton and Blythe islands. 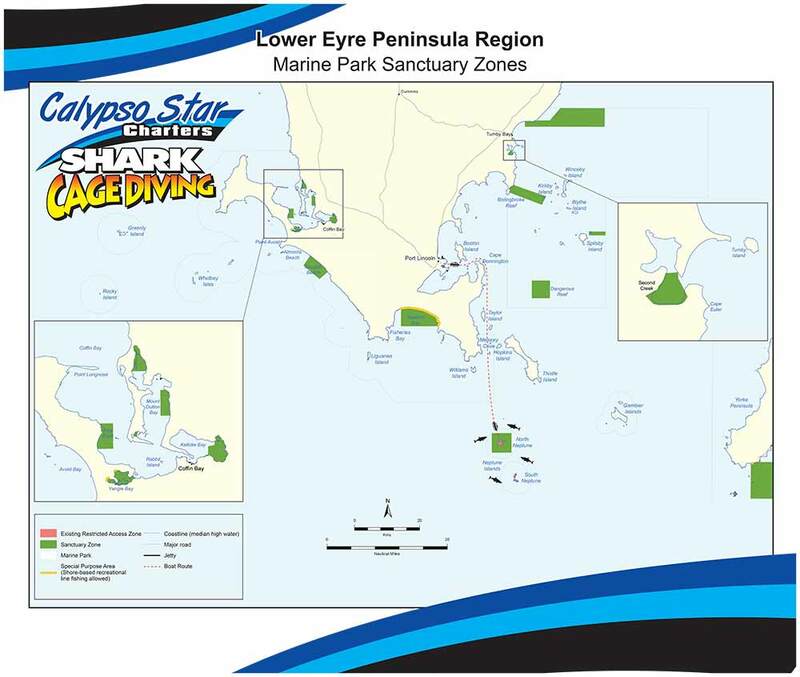 We travel through the Thorny Passage Marine Park on route to Neptune Island Marine Park for our shark cage dive. We also pass through on our Swim with the Sealions trips to either Hopkins or Grindal Islands. The park includes the waters off lower Eyre Peninsula, extending from Frenchman Bluff on the west to Memory Cove on the east. Its varied and deep-water habitats consist of diverse communities of sponges and invertebrates on the hard bottom, and unique underwater sand dune fields, which can rise up to 5m. 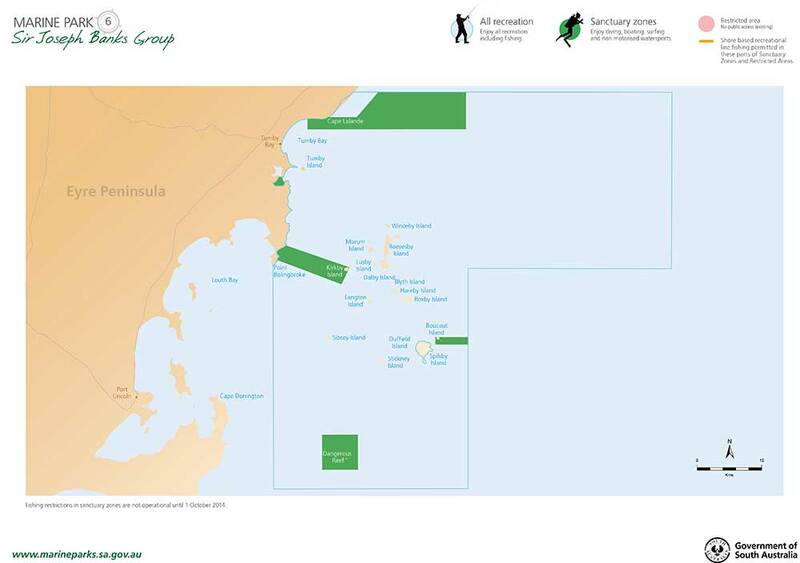 Access to the Thorny Passage Marine Park is from Coffin Bay, Kellidie Bay, Dutton Bay, Farm Beach, Little Douglas, Point Avoid and Sleaford Bay. Calypso Star Charters acknowledges and respects the traditional owners of the ancestral lands of the Eyre Peninsula. We acknowledge elders past and present and we respect the deep feelings of attachment and relationship of Aboriginal peoples to country. The traditional Aboriginal custodians of the lands and seas in the Lower Eyre Peninsula area are the Barngarla and Naou people. 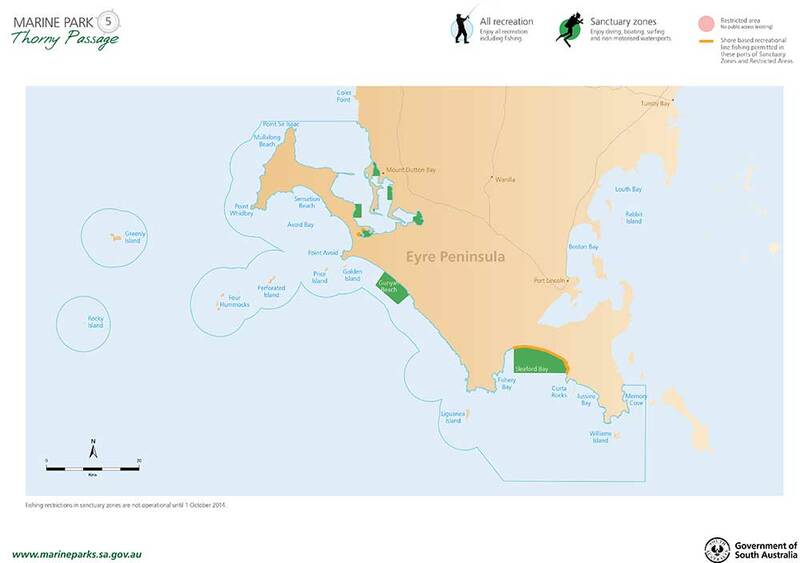 Other traditional custodians further along the Eyre Peninsula coast are the Wirangu and Mirning people.